The Very Large Christmas Quilt, Finished! So, how large is it? It’s 64″ by 80″ now that it’s washed. That’s not so very large, a nice twin size, but it’s just much larger than I meant it. How did it grow so large? Lack of planning on my part, I guess, and a series of design decisions based on scale. 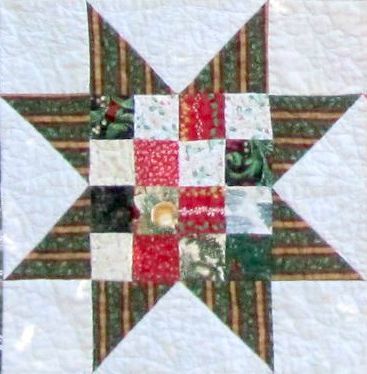 I used the Four Patch Star tutorial from The Missouri Star Quilt Company. I understood that it makes 16″ blocks. (I really recommend this pattern if you need to make a big quilt fast!) I can do the math. I’m sure I started off thinking that I would just use six of these blocks for a throw-sized quilt. When I mocked it up in EQ7, it was clear that the stars were too large and looked way out of scale. That was when I went to twelve of them. It looked much better. I don’t think I considered the border. 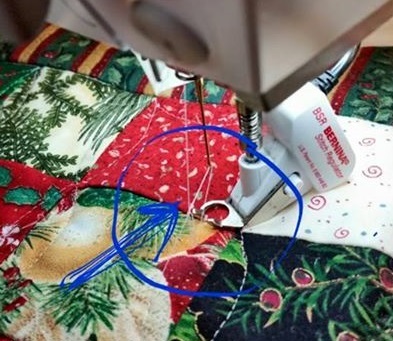 Or how large the repeat was in my fabric. Anyway, it’s a lovely large quilt, and I didn’t have much trouble quilting it on my dsm. 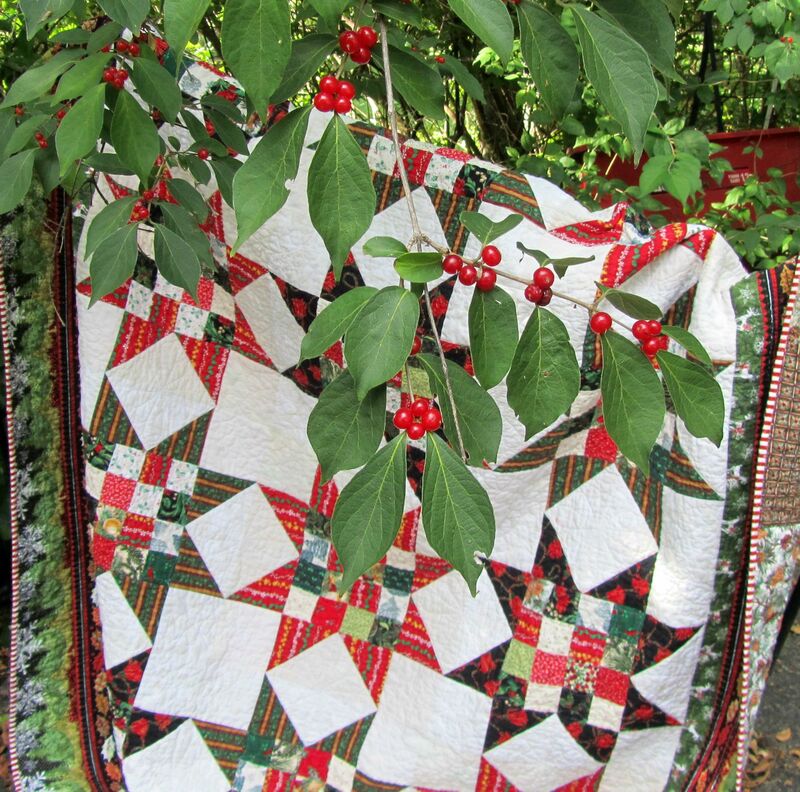 One goal of this quilt was to use some of my large stash of older Christmas fabric. 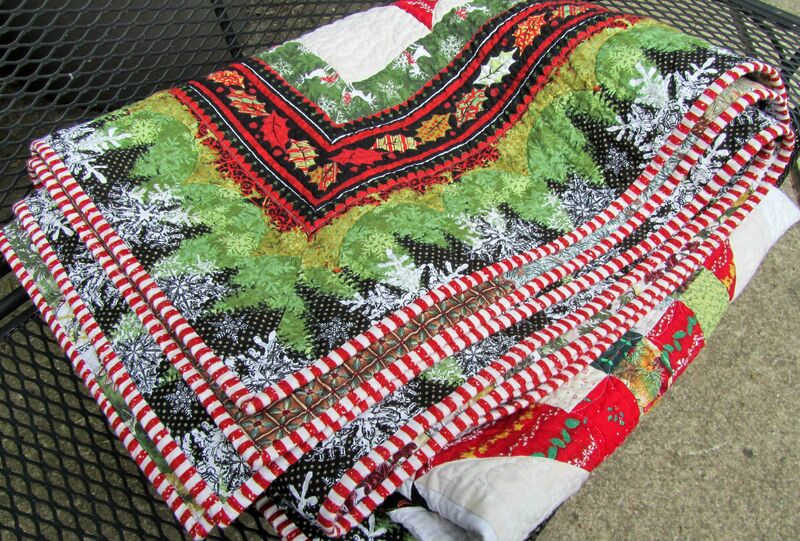 It’s all pretty, and I’m down to mostly red and green traditional prints that go well together. I cut the smallest bits into 192 two and a half inch squares for the centers (I didn’t use Jenny’s speedy method). Chain piecing these went quickly. Then I used the tutorial’s method for making the giant flying geese from pairs of ten inch squares that I cut from my yardage. My background fabric is two white batiks and two white Grunges. Unlike some MSQC patterns, this didn’t result in the dreaded bias edges, and it went very quickly. 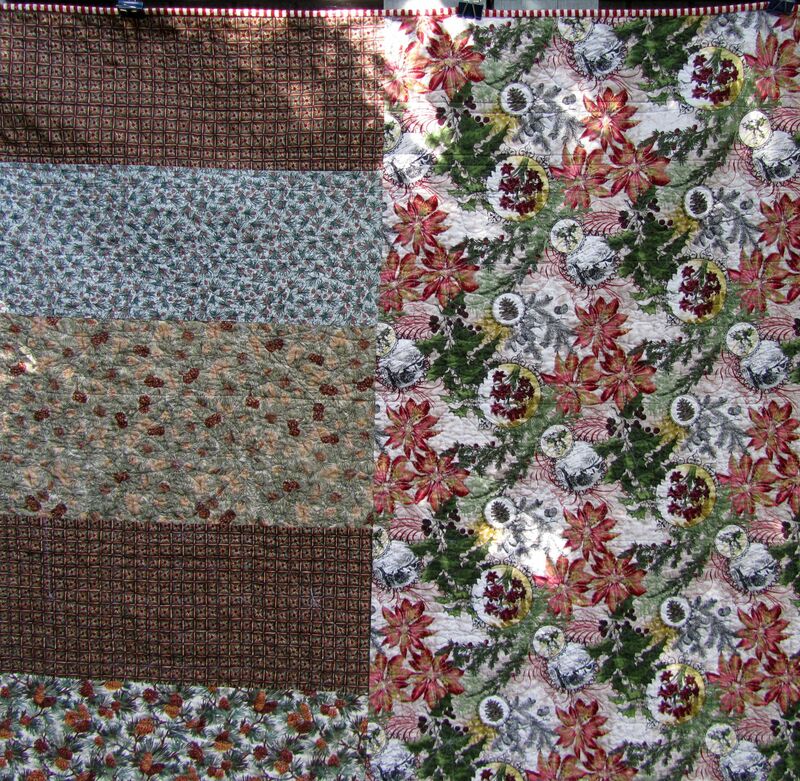 When it came time for the borders, I found that my (newer) fabric had a ten inch repeat. I wouldn’t have had to use it all, but I liked it all, and, again, a more narrow border would have looked out of scale. I really liked how all the colors worked with my stars, and how it looked like I had pieced it from several fabrics. I still didn’t realize how large it was until I measured it for my backing. The three yards of newer fabric I had for the backing didn’t come close, of course, so I dug out a lot of older pine cone fabrics and added them in. 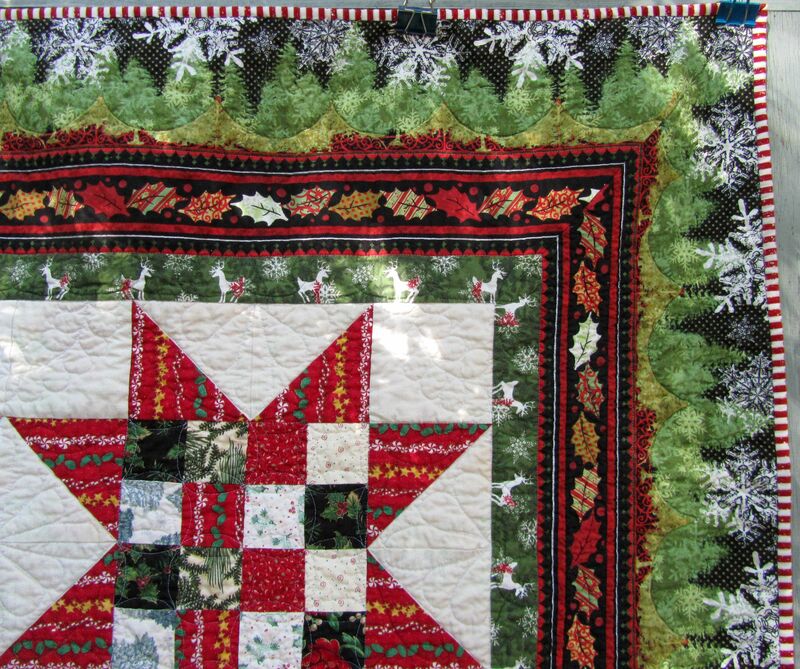 This now has everything you could want in a Christmas quilt! To quilt it, I used Orange Peel quilting in the centers and a loop design I made up for the star points. In the white areas I used feather wreaths and sort of a feather/snowflake/loop design. Then I spent entirely too much time quilting the borders. I did some loops, but also outlined every holly leaf and pine tree. Yeah. But it looks good. I had some difficulty on the star blocks where my needle did this. The #Twilters!, especially Sally, helped me through it. Cleaning out the lint and slowing down helped some, but it really stopped when I changed to a size 90 needle. I sew fast and I’m sure I was pushing and pulling this large quilt and bending that poor 70 I had been using. And I topped it off with red and white striped binding. 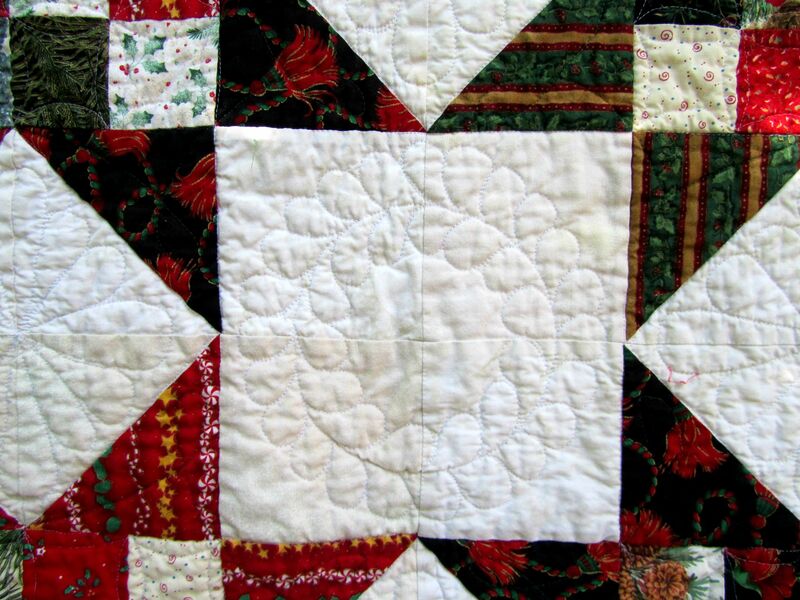 Really, what more could you want in a nice large Christmas quilt? I’m linking up to Finish It Up Friday and Whoop Whoop Friday. Beautiful! Love your fabric and color choices! I really like that border fabric. 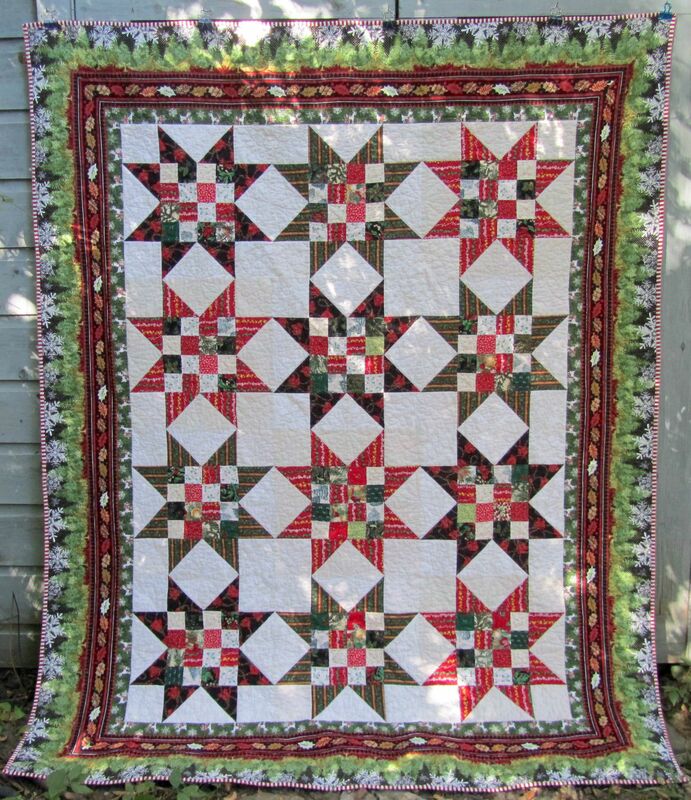 I love Christmas quilts, and your one is a beauty!